Anyone is welcome to attend our meetings, whether you are an experienced entrepreneur or someone just thinking about starting a new business. Our regulars come from Ware, Hertford, Hoddesdon, the wider East Herts area and beyond, and cover a broad range of industry sectors. This blend of backgrounds and experience, combined with our welcoming and friendly environment, produces a rewarding and memorable business breakfast. There are no regimented timetables, bells or gongs – just friendly, relaxed networking. We always meet on the second Wednesday of the month. We gather from 7.15am for a 7.30am start and we always aim to finish at 9am. There is plenty of time to chat over tea or coffee before we sit down at the table around 8am. As well as a full English breakfast, you can also choose from a selection of cereals, fruit, pastries and juices. Following a short welcome from the chairman, we all have 60 seconds to talk about our business and share any news or advice. 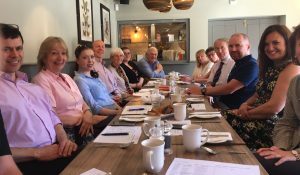 We also offer regulars the chance to speak about their business or deliver short workshops, while other meetings might have a theme or group activity. Our goal is to share ideas and experience to change and improve your business, while potentially unlocking opportunities with new customers. We always encourage collaboration within our group, so we can help each other become more successful, but there are no referral forms or targets. At the end of every meeting there is another chance to chat and catch up over coffee. EAT: get your day off to a great start with a delicious breakfast.